When in your home, we always assume a guest mentality. As part of our commitment towards providing excellent appliance services, we follow a truly unique approach to finding a lasting solution to all of your appliances’ problems. We always ensure full protection of your property while in your home. To this end, we use mats, floor coverings and other safety equipment as protective measures when working on your property. Any of our professional technicians can safely handle your appliance problem as they always ensure to have all technical service information on their laptops. 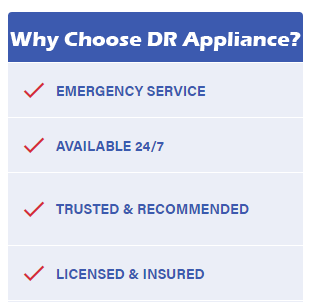 Why Hire A DR Appliance Technician? Bear in mind that all appliance service technicians at DR Appliance are certified and factory trained to provide you with the peace of mind you need thereby helping you to know fully well that the job will be rightly done at the first time. Also, it is good to know that our Bellevue Appliance Repair comes with a 1 year part and labor warranty. So when you need an appliance repair to be done right, the first time, the company to call is DR Appliance – a service company that respects both you and your property. Of course, there are many times when you can maintain or even fix some of your home appliances all yourself such as changing a dead bulb, readjusting a noisy refrigerator and other easy fixes like that. However, there are certain problematic situations you cannot just handle on your own, as you would probably have to call on us for a quality Bellevue Appliance Repair. DR Appliance is your best, most-trusted option for appliance repairs and maintenance. Our company is staffed with qualified technicians that are highly trained, guaranteed, vetted and licensed to fix all of your appliance repair needs. Regardless of the kind of brand you use or where it must have been purchased, we are your best choice for any appliance repair. No matter what your appliance emergency may be, our local technicians are always near you to provide you with a lasting solution. So be calm and rest assured that your appliance problems will be ultimately solved once we lay hands on them because we are experts at repairing appliances in your home. What Can a DR Appliance Technician Do? DR Appliance technicians are versed in handling any type of appliance repairs including refrigerator, dryer, washer, dishwasher and AC Repair. Below is an abridged list of the repair services we offer. Refrigerator problems are many ranging from unnecessary leaking, frost buildup, absence of water in the dispenser, inability to make ice to strange noises, torn door gasket, high power consumption and bad compressor. These are just some of the most commonly repaired refrigerator problems. However, there are still other problems that can occur with refrigerators. To this end, it is recommended to make an appointment with a highly trained, local DR Appliance specialist. Our local technicians are always available to come right into your house and proffer a perfect solution. No matter the brand of your refrigerator, we can fix it. Whether you are looking to have a quality dryer repair, dryer vent maintenance or even a dryer replacement, DR Appliance can help you. We take pride in providing our customers in Bellevue with quality appliance repair. As your best most-trusted local option, we are ready to provide you with easy, quick and fast dryer repair, service and maintenance. Whether it’s your dryer door that opens the wrong way, or a burning smell always comes out of your dryer or it just refuses to get hot, we will always get you connected with the best local dryer repair technicians in the business. Note that our technicians are not only vetted, licensed and trained to serve you but they are guaranteed to help fix all of your dryer needs. No matter the nature of your appliance emergency, don’t get hung out to dry, Just send us a call and a local and a local technician from DR Appliances will be at your home to help you in less than no time. When it comes to Bellevue appliance repair, services, and maintenance, we will always remain your best and most dependable option. For easy, quick and fast washer or washing machine repair, service and maintenance, feel free to call on us. Whether you have a leaking washer or your washing machine smells bad and won’t start, we will always connect you with the most professional local washer repair technicians in the business. No matter your appliance emergency, these highly trained licensed and guaranteed technicians will always help to fix it. DR Appliances can help you to repair, maintain and service your dishwasher in the quickest possible time. Whether your dishes aren’t just getting clean enough or your water refuses to drain out of your dishwasher, our dependable dishwasher repair technicians are always available to provide you with the best solutions. Regardless of your appliance emergency, these local technicians are always available to help you. Your Air Conditioner is designed to keep you cool in summer and warm in winter without having to create enormous utility bills. DR Appliances can ensure that your home gets the right temperature at all times. We specialize in rendering quality AC maintenance, installation, and repair, so as to ensure that your cooling system is running effectively as expected. When you notice any usual operation in your AC system, do not hesitate to call us for a quick repair solution. No matter the brand of your home air conditioning or heating system, it is good to know that we can fix it for you.